Techies commuting in San Francisco sometimes have to wait for one or two stuffed buses to pass before boarding one with room to carry them from Marina or Mission downtown. This obviously takes away from time they could be devoting to disrupting things, which is obviously terrible. My old-economy, twentieth-century brain is thinking that buying more buses, hiring more drivers, and expanding the SF Muni system to make more seats on more buses for everyone would be the way to go to resolve this problem. How wrong I am! The answer, as always, is a private startup! These buses are going to have fancy coffee and WiFi, and they’ll go where the people who can pay $6 per ride want to go, instead of stopping at other places along the way where “the public” might try to get on board. Don’t worry, this isn’t creating a price-based filter to keep poor people out while shunting the wealthy into a private and more desirable alternative. It’s “reimagining” transportation! Truly, a new idea that no one’s thought of before. 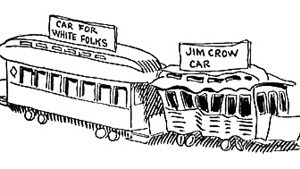 These small experiences created an infrapolitics–an implicit script of action that helped to define and shape daily life in Jim Crow Birmingham. I don’t want to diminish the significance of major events like the Birmingham campaign of 1963, but the contested question of who would enjoy the ride to work on a daily basis was as much a part of the fabric of life in Birmingham as the actions of Bull Connor or the determination of the city’s business elite to resist integration. They seem to be making some kind of point, or even resisting the daily infrapolitics of an increasingly socially segregated city. 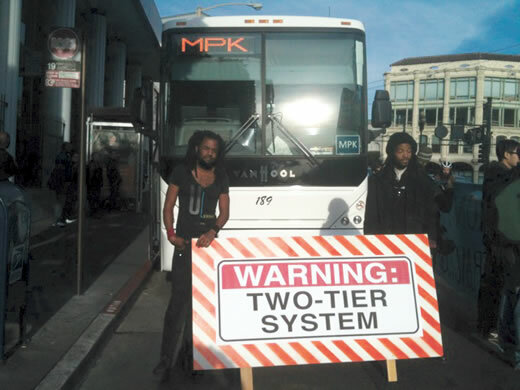 Of course, this is San Francisco and there’s no racism here, so maybe my analogy is flawed….